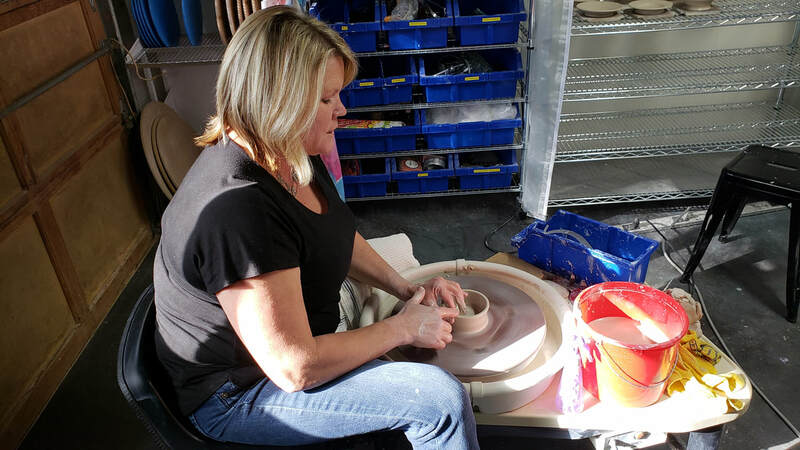 I discovered my passion for clay in 2011 when I happened upon a pottery studio at the local rec center four miles from our new home in Chapin, SC. Since then I have buried myself in the chemistry of glazing, immersed myself in the artistic side of creating, delved into the practicality of kiln building, and even explored the mystical side of pit firing. I love the endless possibilities of technical challenges and artistic opportunities allowing me to create both decorative pieces and practical pots for everyday use. My eclectic hobbies (include beekeeping, soap making, gardening, quilting, cooking, fishing, stained glass, antiquing, chickens, just to name a few) are a constant source of fresh ideas and inspiration.. I grew up in Saudi Arabia, Bonaire, and Panama. As an adult I have moved frequently within the USA.I started out with a career in health care as a Child Life Specialist then as a Neonatal Intensive Care Nurse. For years I was fortunate to focus on being a mother to two wonderful boys. We moved back to GA in 2017 and have been renovating our house to include a studio space with a small gallery area. Bits and pieces of my life are in every piece I create. My hope is that every piece finds a new home and builds its own story as it shares the life of those who use it. During the tour I will be around to answer any questions you may have and you are welcome to wander through the studio. I’ll be throwing on the pottery wheel and working throughout the day. Help yourself to a munchie and a beverage and stay a while. My hubby and sons will also be available to answer questions, to wrap up any purchases, and get you checked out. On your way out, stop to visit our bantam chickens. Drive up the shared gravel driveway. We are the first one story ranch house on the left. Park anywhere in the grass. Follow the path across the front of the house to reach the side entrance on the left of the house.